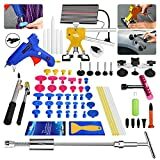 Dent removal tools or kits are devices that help you lift a dent out of your car’s bodywork, and return it to its former glory. It’s like an iron that straightens out any creases in your car’s figure. It doesn’t matter if it’s small or huge. It doesn’t matter if it’s visible or barely noticeable. A car dent will leave you miserable every time you go for a drive. Eventually, you’ll head for the garage shop and spend a ton of money getting it fixed (Source). But what if you don’t have to? What if you can fix the dent yourself? Wouldn’t that save you a lot of time, effort, and money? Luckily, with the right dent removal tools, you can get the job done. The only thing you have to worry about is finding the right one. A good dent removal kit should be versatile and easy to use. It should also be affordable and at the same time, made by a reputable company. 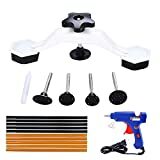 If you’re having a bit of trouble choosing a good dent removal kit, here is a list of the top 5 kits on the market and what makes them the best. 2.1 What’s inside the kit? 3.1 What’s inside the kit? 4.1 What’s inside the kit? 5.1 What’s inside the kit? 6.1 What’s inside the kit? This dent removal tool is one you can definitely rely on in tough times. Whether it’s a small, tiny dent or a huge one, the Yoohe can fix it for you. The Yoohe Paintless Dent Removal Kit comes with quite a few useful tools. It contains a dent lifter, 15pc pulling tabs, a suction cup plate, and a hot melt glue gun. But don’t let all the fancy words scare you. It’s super easy to use. The Yoohe doesn’t require any special skills. Practically anyone can use it. You don’t have to be experienced in panel beating. In fact, the whole process of fixing your dent is as simple as massaging it from the inside using very special tools. One thing you’ll be pleased to hear is that you won’t need any sanding or paint touch up when you use the Yoohe. It’ll pull the dent back to normal without ever having to change the original factory paint of your car. Who says a dent removal kit should only remove dents? The Yoohe can also be used for a variety of other problems with your car’s bodywork like hail damage and car door dings. Talk about versatility. The Yoohe PDR kit is one of few kits that are eco-friendly. It doesn’t need electricity, produces zero toxins, and involves a chemical-free manufacturing process. Cars cause enough pollution. Good thing this kit doesn’t add to it. The best part about this kit is its price. You’d expect it to be quite expensive will all the fancy components and guaranteed efficiency, but it’s actually quite affordable! It has the best value for money and won’t leave a dent in your pocket nor your car. 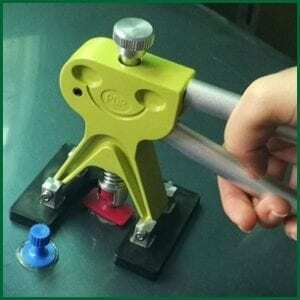 1 PDR bridge dent puller: The main part which is responsible for pulling your car back into shape. If you haven’t been impressed so far, the Gliston Dent Removal Kit will definitely amaze you. Let’s just start out by saying that the Gliston offers you two choices: a 64pc kit and an 89pc kit. Both are enormous, so let’s say you’re interested in the smaller of the two. What’s special about it? Well, the Gliston PDR kit is as versatile as it gets. Small dents, major dents, hail dents, it doesn’t matter. The Gliston can fix it all. Makes sense, doesn’t it? With 64 pieces inside that kit, there’s bound to be something for every problem. If you’re someone who knows their kits, you’ll be pleased to hear that the Gliston contains a reflector board, rubber hammer, and T-bar. 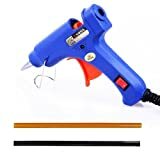 Those are just some of the more unique tools that are used in fixing difficult and frustrating dents. When it comes to using the kit, you don’t need any prior knowledge or skills. However, with the huge variety of tools, you might want a bit of help or supervision to navigate your way through the right tools. It’s not as simple as the Yoohe. Of course, since we’re talking about 64 pieces, all in one efficient kit, the Gliston is a bit expensive. But if you think about the huge variety you’re getting in exchange, it would justify the price. 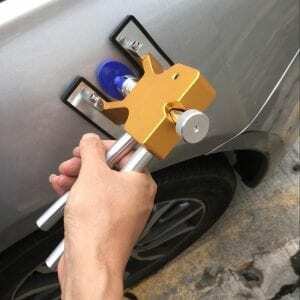 Here’s another excellent dent removal kit by Yoohe. This one is a lot cheaper than most kits you’ll find online, so if you’re on a tight budget, this is the kit for you. Don’t be fooled by this Yoohe’s price. It might be the cheapest one on this list but it still gets the job done. With the few tools it has, it can remove even the most frustrating of dents. Sure, you might not be expecting much with just 17 pieces to the kit, but those 17 are absolutely vital to dent removal. You won’t find anything useless or meaningless in this kit. Everything is business. Using the Yoohe requires absolutely no prior experience. Almost anyone can fix their car dents with this deluxe kit. It doesn’t require any paint touch up or sanding or anything for that matter. What the Yoohe lacks in quantity, it makes up for in versatility. This dent removal kit doesn’t just treat car dents. It can be used for a variety of other problems like hail damage, car door dings, and dents on things like fridge panels and dishwashers. Just like the first kit on this list, this Yoohe is eco-friendly. No electricity, chemicals, or toxins whatsoever. It’s safe, efficient, and reliable. So if you need something that’s budget friendly and still works perfectly, this is the kit for you. Super PDR is one of the most popular brand names when it comes to car accessories and equipment. It’s built quite a reputation for itself. Of course, this reputation extends to its impressive dent removal kit. Just like the Gliston, the Super PDR offers comprehensive dent repair. However, it’s a bit more expensive than the Gliston. The Super PDR is perfect for everyone, whether you work at a garage shop, or you’re trying to fix your car by yourself at home. If you’re having trouble getting the job done, the kit comes with an easy guide to help beginners and a detailed user booklet. This dent remover is a bit more sophisticated than your average kit. It comes with an LED reflector board to help you locate dent positions. There’s also a padded gold dent lifter that gives you an accurate and tight grip with max pull power. Quite expensive, although not as much as a trip to a garage shop. This kit might be expensive, but it’s really worth every penny. The HOTPDR allows you to remove all kinds of dents within minutes and without the help of a garage shop. Just like the last dent removal kit, the HOTPDR comes with an LED reflector board that helps you locate dents and see them clearly. It doesn’t require any skills whatsoever. An absolute beginner can get rid of any frustrating dents. One of the best things about the HOTPDR is that it doesn’t touch your paint. It fixes you dent problem without affecting the original factory paint job, so there’s no need for a paint touch up afterwards. You’ve just went through 5 of the best kits on the market, so you probably have an idea of what makes a good dent removal kit. But in case you might have missed something, here’s what you should look for. Don’t let the names fool you. A lot of kits offer much more than just “dent removal”. Some kits can be used to repair hail damage, door dings, and dents that are found on all kinds of panels. It really depends on what you want. If you don’t care for a wide variety of application, then go for the simplest kit you can find. But if you want something that’ll work in multiple scenarios, then versatility is something you should consider. Be careful. Not all kits are made for beginners. Some dent removal kits should only be operated by professionals who know exactly what they’re doing. So you should factor in your level of experience. If this is your first time repairing a dent on your own, then go for a beginner kit. Even better, choose a kit that comes with a user guide or any form of tutorial. If you’re more of a veteran when it comes to dent repair, choose a professional kit. Some people would argue that price is the most determinative factor when it comes to buying a dent repair kit. In fact, it affects your purchase of anything for that matter. So you should definitely consider your budget before buying a kit. There are lots of very efficient dent removal kits that cost less than $50 and still get the job done. Others can cost well over $100-$200. So think about your budget. And remember, you’re likely to spend a lot more in just one trip to a garage shop. We all hate car dents. And as if the dent itself weren’t bad enough, the cost of repairing them at a garage shop is ridiculously high. That’s why having your own dent removal kit is a great idea. 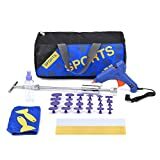 If you’re someone who loves their car and wants it to stay in top shape, then you definitely need a kit. It’ll keep your paint job intact and pull your car’s bodywork back to factory smoothness. Just pick a good kit. After all, you don’t want to make the dent even worse and end up shamefully driving to the nearest garage shop, do you? If you’re having trouble choosing, just pick one of the 5 on this list. They’re the best of the best. And they won’t put a dent in your pocket.